Nothing hurts my heart more than hearing from an animal lover whose cherished companion animal has died in an accident that could have been prevented. 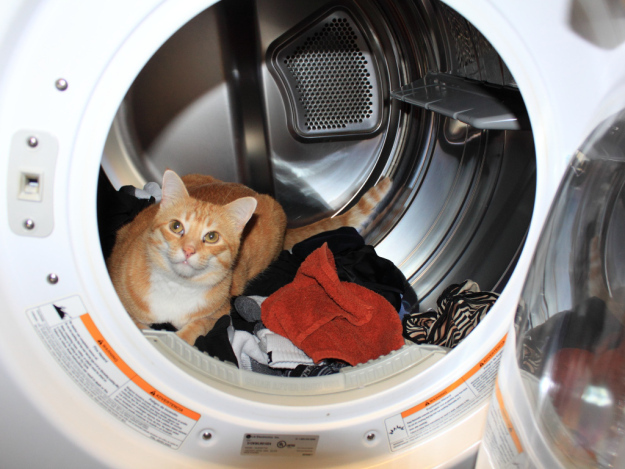 In my many years of moderating an online pet loss forum, far too often I have heard from pet parents whose precious cat or kitten has died after being trapped in a clothes washer or dryer. Losing a beloved animal in such a horrific way leaves a person with gruesome images and devastating feelings of grief, guilt and remorse. Certainly these pet parents did not set out to bring harm to their precious fur babies ~ but accidents can and do happen. We are human beings, and human beings make mistakes. Sometimes the mistakes we make have tragic consequences, and we are left to live with them, to find a way to forgive ourselves, and to learn whatever lessons we can from them. The following stories come from members of our online Loss of a Pet forum. I share them here for several reasons: first, to emphasize that this kind of accident is way too common, and that it can happen to anyone; and to let you know that, if this has happened to you, you are not alone. I Accidentally Killed My Cat in the Dryer - Yesterday i threw some towels in the dryer and turned it on...i went to get the clothes and to my horror my cat was dead in the dryer. I have cried since then, i can't eat...i feel so guilty..i keep begging for god's, Babar's and all the powers that exist for forgiveness.....i don't think i will ever be right again...I dearly loved him..we shared ice cream...and cheese....i could never hurt him....how wil i ever forgive myself? Begging for forgiveness. I Killed My Pet Cat! - Folks, I am beyond heartsick. I accidently killed my Pet cat..he jumped in the dryer last night as I was pulling out a wet comforter from the washer and I stuck the comforter in the dryer not knowing he was there. I normally investigate any thumps or spare change in the dryer but this time I walked away thinking the queen sized comforter was just wet and knotted up. About 45 minutes I went back in to look and opened the dryer and pulled out the blanket..at first I thought a neck messager must have gone through the wash and dryer but then his dead body rolled out. Bottomless Pit Of Unexpected Devastating Losses - I don't know where to begin . . . Last Friday our one year old fluffy grey and white kitten April jumped in the dryer while my back was turned taking a large grey blanket out of the washer and put it in the dryer. I accidentally killed her. I didn't double check the dryer because I did not even realize that she was in the laundry room with me. Our pets bring my family the unconditional love that we need and I just cannot understand why we have to endure these losses. I feel so guilty for not checking the dryer. I don't know if I will ever come to terms with the loss of April especially since it was something that could have been preventable. Writing this out makes me look like a horrible pet owner. I also feel guilty that I didn't have enough money to try and save the other pets. I am lost. I am still in shock and the tears are unending. How do you come to terms with knowing that the family members that cannot speak but show so much love and comfort suffered so much and left us long before they should have. My Wonderful Cat, Boo - The last few days have been hellacious for my family. I found a wonderful shelter to take one of my cats whom I couldn't keep in anticipation of a downsizing move and the same day as I was doing laundry, my other cat, Boo Boo, hopped into the dryer without my knowledge and, LORD GOD FORGIVE ME, I SHUT HER IN. My mom came running up the stairs after she found Boo Boo and I called the vet's office after she told me what had happened but it was too late. Boo Boo passed away in my mom's arms. She was a wonderful grey and white tabby, fat and loveable, I called her "the marshmallow cat," because of her size and wonderful personality. I hate what I did and losing two wonderful animals has been a hard blow in an already stressful time. My Cat died an accidental death - . . . on Monday morning I experienced the most traumatic experience of my life. I have a cat named Bailey who I got when he was about 6 weeks old. I loved him the moment I laid eyes on him. We had an amazing bond. He would always find his way to be around me and he followed me every where that I went. We both enjoyed cuddle time and he always loved laying on my chest suckling my ear. On Sunday night it was the same thing with us. He followed me around all night. He lay on top of my chest and we cuddled for a long time. It had been a long day and I was tired so I decided to take a bath to wind down for the night.. He always came in the bathroom and lay by the tub. After I was done I had to go put my daughters school uniform in the dryer that I had washed for the next day. Bailey followed me in the basement as always. We played for a bit as he ran around the basement, running and jumping. I went in the washer to get my daughters uniform and put it in the dryer and it was only a shirt and a pair of pants. I put it in the dryer and cleaned out the lent trap and turned the dryer on. I then went upstairs and went to bed. I thought to myself it was strange that Bailey didn't follow me up but I thought maybe he got tired and went to sleep from all of the running and jumping. I forgot to mentioned that he is now six months old so I had him for a while now. The next day I woke up On Monday morning around 7:45 to get my daughters uniform out of the dryer and get ready for school. I opened the dryer and pulled her pants out and it had rad stains all over it. I thought maybe she had something in her pocket and it got all of her clothes. Then I looked at the dryer door and it was red stains all over it. I was still confused to what this was so as I was reaching in the dryer to get her shirt, I saw the most traumatic thing of my life. I looked in disbelief and saw my Kitty laying in the dryer lifeless and blood splattered everywhere. I screamed at the time of my lungs No over and over again. I kept saying my baby my baby!!! I ran upstairs and my screams had woken my husband and daughter up. I cried Bailey is dead, he got in the dryer!!! I didn't see him, how did he get in there? I am so confused because I never heard him get in the dryer and he never done that before. My heart hurts so bad because how did I not see my Kitty get in the dyer. How did I not hear him when I only put two things in the dryer. It breaks my heart that I couldn't save my baby!!! I cant get the thoughts out of my mind of the pain that he endured that night while I slept. My baby was hurting and I couldn't save his life. I am filled with guilt and blame myself because how did I not see my kitty. Everyone keeps telling me not to blame myself because I didn"t know but it hurts so bad because I turned on the dryer. I want to turn back the hands of time and make this nightmare go away. I want my Bailey back. I miss his cuddles, his purrs, and the way he stares me in my eyes with so much love. How could happen and how did I not see him in there. I been crying everyday and I cant get the image out of my head of him lying there. We were just playing together and now he is gone. Me and my daughter was the closet to him and she is taking it hard. It didn't want her to see him in there but she went and saw him anyway. Now she is going through what I am going through. She cant get it out of her mind and she has not been herself since. I cant go back in the basement and do laundry because that hurts me more. Everything reminds me of him and it hurts my heart so bad. I am devastated because I am suppose to be his protector and He is gone now and I couldn't save him. He had to suffer so bad that night and it hurts me that he had to endure such pain. I want him back and I cant believe he is gone. He was a part of our family and We loved him so much. I am hurting so bad!!! Just a Normal Morning - I'm a fairly busy man of 32. My wife is disabled leaving me to care for her and my two Children (2 and 4). For the most part we're a normal family with two cats a dog and a fresh litter of 7-8 week old kittens. As I said life can be rather busy. Saturday night around 6 I was of to feed a friends dog. I quickly did the dishes and throw some wet washing in the dryer, the dryer mad a clump like there was a shoe inside, I don't know why I didn't open It up to check it. When I got home it was time to get everyone to bed and I just left the rest of my jobs until Sunday morning. Sunday was just another normal morning. I got the children their breakfast and my wife a cup of tea and then got started on my things to do. I opens the dryer up....shock. There was one of my kittens laying...broken on top of the washing. I'm not emotional by nature, pets passing is always a sad time but I've never been moved to tears. I let out an almighty " Nooooooo". When I pulled the kitten from the dryer it was obvious he had suffered an awful horrific death no creature should have to ever experience. As I said, I'm not emotional by nature, my wife's even accused me of being quite cold hearted. I'm not coping well though, I cant stop seeing that little kitten and its little lifeless eyes looking through me. I honestly thing this'll haunt me forever. I should have checked the dryer when it made a clump. I should have left the door closed. I saw the kitten sniffing there a few days ago and thought to myself " I better be careful". Its my fault, and I deserve my guilt. I Killed My Pet Cat! - I lost my baby girl this morning by the dryer. Im devastated and hurt I can't believe I didn't see her get in. she was a rescued I found her two years ago. I know it was a accident it still just hurts so bad. I killed my cat in the dryer!! - My family adopted two kittens 6 months ago one was Gigi the other was Taz. Monday morning Taz was being his normal self always under foot and curious and I went to change the laundry over and put my wet towels in the dryer. I turned it on and heard thumping, I didn't think anything of it because lately almost all loads were seeming to do that. I walked away and fed the cats and noticed Taz wasn't there, I just thought he was sleeping or not hungry. I went to work and when I came home my 16 yr old asked if I saw Taz. We went out looking for him and then I heard my 23 yr old boy screaming for me. He opened the dryer and there was our little guy! My 16 yr old is taking it pretty bad and I can't stop playing the day over and over in my head that it was my fault and what I should have done. I miss my curious stinker so bad! I cry out of pain for my kids and pain of guilt. I didn't mean to do it I love all my cats. Gigi was never really a jump on you and love cat but ever since Monday he has been loving and does seem to be looking for Taz and that breaks my heart. I know I will stop to hurt so bad but I never killed anything in my life. Once I hit a possum but took a towel and moved his dead body out of the road and sat next to it and cried. I Accidentally Killed My Darling Cat - Hi everyone, I was searching online to just see if anyone has experienced something similar to what I have just experienced and I have, thanks to this site, so it has been a little help thank you. Yesterday my beloved cat Orca, a beautiful, scatty and unique 1.5yr old Bengal died and it was all my fault. I feel sick to my stomach, and the pain is so bad. I was in total hysterics when I found her. She had climbed into the washer/dryer and completely unaware, I shut the door and turned it on for a 30 minute drying cycle. I heard absolutely nothing, no crying, no thudding, nothing. I can only think that she must have climbed in when I had gone to my bedroom to hang up some of the wet clothes. We have a washer dryer, so I opened it after the wash cycle, took out a few items that needed hanging as opposed to drying and made my way into the bedroom to hang them up. I then went back to the washer/dryer and closed the door and started the cycle. We have a front loading washer/dryer, so unless you bend down on your knees you can't see in. I wish, wish, wish I had checked. I wish that I had to add a couple more clothes to the machine, I can't stop thinking about it! At around her dinner time, I decided to feed her, I called and called for her but heard nothing. I took her food bag and shook it, that usually does the trick but nothing. I turned the apartment upside down and began to panic. I also went outside calling for her, as I thought she might have got out the window, but nothing. I then came back in and just said to myself "she must be somewhere, the little sneak". I didn't in a million years think she had got in the dryer. When I went to open the machine to take out my clothes, I could see her beautiful patterned fur amongst them all! I couldn't believe it, I pulled her out as fast as I could, and for the slightest of seconds I thought she might be OK, but she wasn't. I can't get that image of her out of my mind, it is going to haunt me forever. Posttraumatic stress disorder (PTSD) can impact anyone who has experienced or even witnessed a devastating or terrifying event. Pairing meditation and PTSD is one of the effective new ways of coping. Health Journeys’ MP3s and CDs offer clinically researched guided meditation for posttraumatic stress to help veterans, survivors of disaster, traumatic illness, accidents, domestic violence and childhood abuse. Belleruth Naparstek and other experts’ guided meditations for PTSD are clinician endorsed and distributed nationwide by health professionals and the US military. For PTSD help, try one of our MP3s or CDs and experience a dramatic improvement in symptoms for yourself. Click here to learn more about the range of programs we offer and which mind-body practices might appeal most to you. A Fatal Distraction: How Can We Forgive When A Parent Forgets? In Grief: What to Do With Cremation Ashes?